October 13, 1998: Mr. Yutaka Katayama, better known as “Mr. K”; was inducted into the Automobile Hall of Fame museum in Dearborn, Michigan. “Mr. K” was one of six distinguished inductees to be honored for their contributions in our automobile past. All inductees could be considered as pieces of the puzzle that put us where we are today with regards to the automobile. The other inductees included: The Opel Brothers, Wilhelm, Friedrich, Ludwig, Carl and Heinrich, famous for the production of the vehicle bearing their name. Andre Citroen, creator of the Citroen car. Charles M. Pigott, former Chairman and Chief Executive Officer of PACCAR, Inc. for decades. Fred M. Zeder, known for his part in the creation of Chrysler Corporation. Count Ferdinand von Zeppelin, producer of automotive components and inventor of the dirigible airship. As many of you know, “Mr. K is the father of the Z Car and was honored for his innovating design of the early Z Car that reset the standards for the time. He helped Nissan to become the best selling import brand in 1975 with combined U.S. car and truck sales of 335,415 units. He also positioned Nissan to become the 1st automaker to sell Americans on compact pickup trucks and “King Cabs”. Though retired from Nissan since 1977, Mr. K still has a penchant for styling. He has played a major role in reworking the Nissan Z concept car that was unveiled at the North American Auto Show in January 1999. Z.O.N.C. congratulates Mr Katayama for his induction into the Automobile Hall of Fame and the joy of knowing he is still a force in our automotive future! 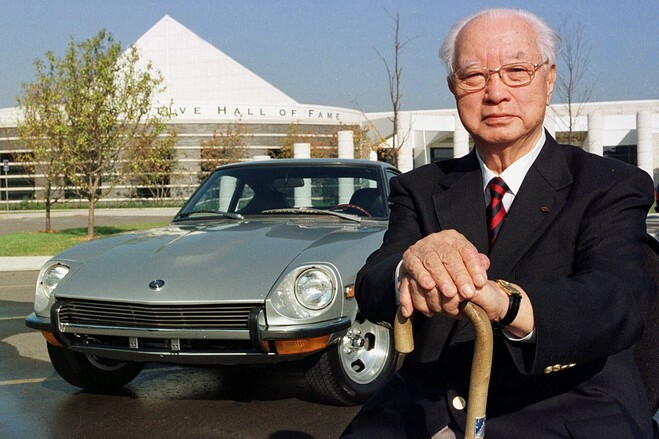 Here is our article: Mr. K (Yutaka Katayama) on the35th Anniversary of the Z car.